Ground squirrels are rodents (gnawing mammals) and are placed in the order Rodentia along with tree squirrels, mice, rats, voles, muskrat, beaver, plains pocket gopher and southern bog lemming. Franklin’s ground squirrels spend 90 percent of their lifetime below ground. Thirteen-lined ground squirrels have been known to hibernate for 250 days. Ground squirrels play an important role in soil aeration. They help condition the soil for plant growth. Their body wastes contribute to the organic structure of the soil. Ground squirrels are also an important part of the food web, being preyed upon by several species of birds, mammals and snakes. Two species of Illinois’ four ground squirrels are described here. All ground squirrels are characterized by a tail covered with hair, nesting in underground burrows and having internal cheek pouches. Most ground squirrels hibernate, and all four species are active during daylight hours. 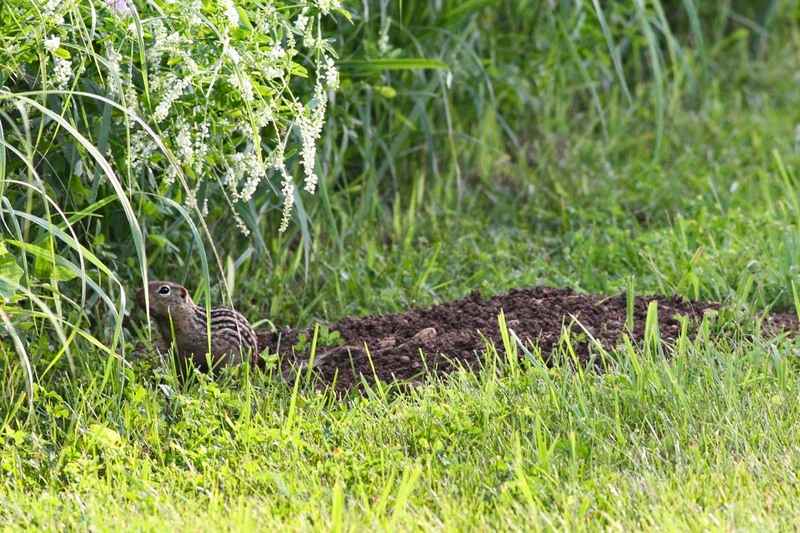 Ground squirrels avoid burrowing in areas subject to flooding. Thirteen-lined ground squirrel (Spermophilus tridecemlineatus): The thirteen-lined ground squirrel is slender with large eyes and small ears. They have yellowish fur and 13 prominent alternating light and dark stripes on the back and sides. The light stripes are yellow to white, and the dark ones are black to reddish-brown with lighter spots. The thirteen-lined ground squirrel hibernates in winter. In the fall before hibernation, thirteen-lined ground squirrels weigh eight to nine ounces and are much larger than a chipmunk. However, by spring when the squirrels come out of hibernation they weigh only four to five ounces. Franklin’s ground squirrel (Spermophilus franklinii): The Franklin’s ground squirrel is a little larger than the thirteen-lined ground squirrel, weighing one to one and a half pounds in the fall before hibernation. Franklin’s ground squirrels resemble eastern gray squirrels but have a shorter, less bushy tail and smaller ears. They have brownish-gray fur speckled with black and the underparts vary from yellowish-white to gray or buff. The Franklin’s ground squirrel is listed as a state threatened species in Illinois. 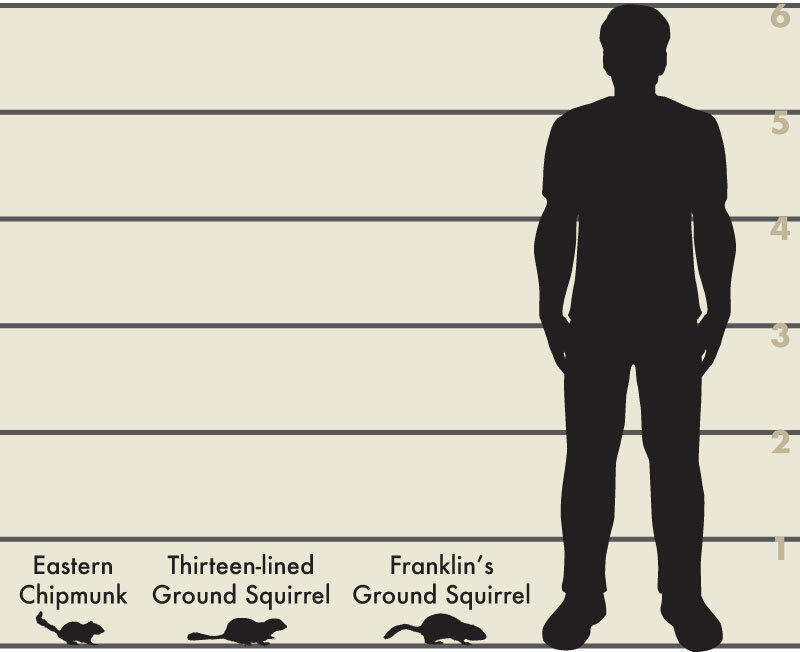 Size comparison between a six-foot tall man, a chipmunk, a thirteen-lined ground squirrel and a Franklin’s ground squirrel. Thirteen-lined and Franklin’s ground squirrels occur in the northern two-thirds of Illinois. The southern limit of these ground squirrels in Illinois seems to correspond with the Shelbyville glacial moraine. Thirteen-lined ground squirrels are abundant in many areas of Illinois, but Franklin’s ground squirrels are uncommon and are listed as a threatened species. Ground squirrels are diurnal meaning that they are active during the day. All ground squirrels are solitary; however, since they are not very territorial, many may be seen in close proximity, particularly if there is a good supply of food at that location. Ground squirrels play an important role in soil aeration, and they help condition the soil for plant growth. Their body wastes contribute to the organic structure of the soil. Ground squirrels are also an important part of the food web, being preyed upon by several species of birds, mammals and snakes. Ground squirrels are not considered to be a public health concern in Illinois. The Franklin’s and thirteen-lined ground squirrels are both found in grasslands or prairies. 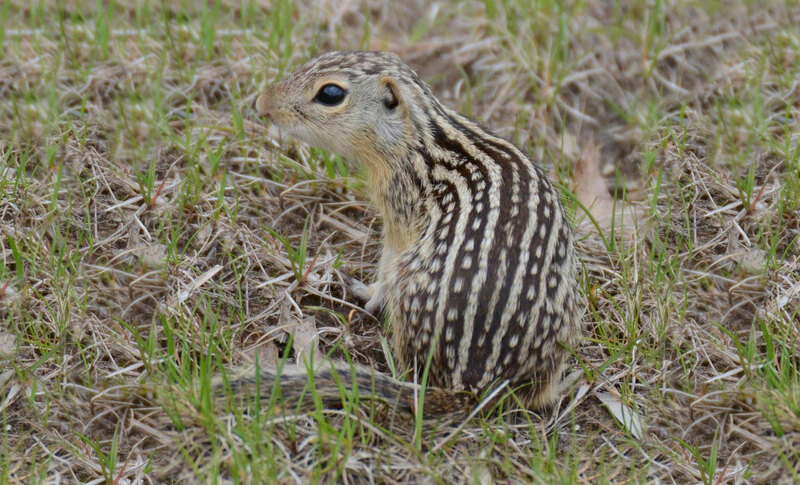 Thirteen-lined ground squirrels live in short grasslands or in weedy areas with short vegetation. They are often found in golf courses, cemeteries, parks or roadsides. Franklin’s ground squirrels are found in slightly taller grass, but prefer the grass to be short enough to allow them to stand on their hind legs and see over the grass. 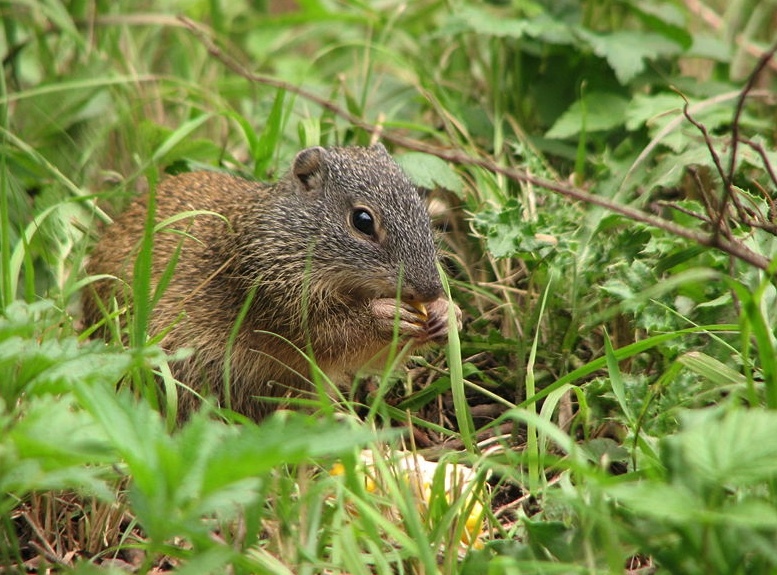 Thirteen-lined ground squirrels feed extensively on grasses, weeds, seeds, cultivated plants and insects. Franklin’s ground squirrels are omnivorous. They will eat carrion, insects, bird eggs, and small birds as well as plant material. Thirteen-lined and Franklin’s ground squirrels have only one litter per year, usually in late May. Gestation is 27 to 28 days with six to seven young per litter. The young are weaned in about four weeks. If ground squirrels are causing problems there are several control strategies available. Note: Franklin’s ground squirrels are threatened in Illinois and are protected. If you are having a problem with Franklin’s ground squirrels CONTACT your local Illinois Department of Natural Resources district wildlife biologist for assistance. 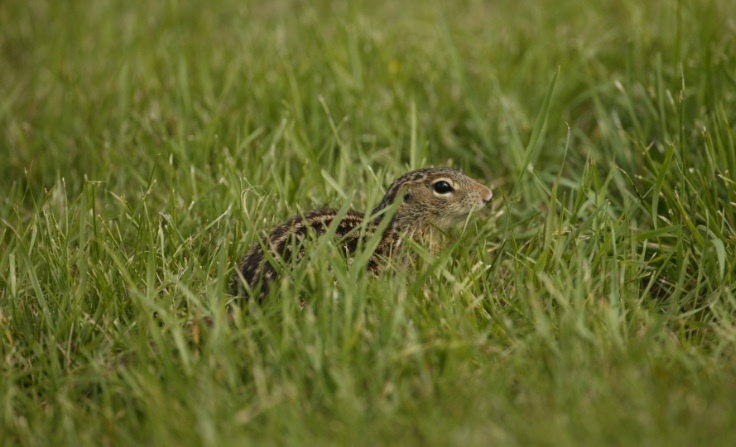 Encourage the growth of tall, herbaceous vegetation to deter thirteen-lined ground squirrels from using the property. Reduce seed bearing weedy plants that provide food for ground squirrels. Keep soils moist through overhead irrigation during the day. Prevent digging in seedling gardens by planting cold-tolerant varieties before ground squirrel emergence in early spring. Exclude ground squirrels from small areas by installing 18-inch high one-quarter to one-half-inch mesh hardware cloth (also called hail screen) buried six inches below ground. To keep ground squirrels from burrowing under foundations, place hardware cloth bent at a 90° angle along the foundation and cover with soil. There are currently no repellents registered for use against ground squirrels in Illinois. 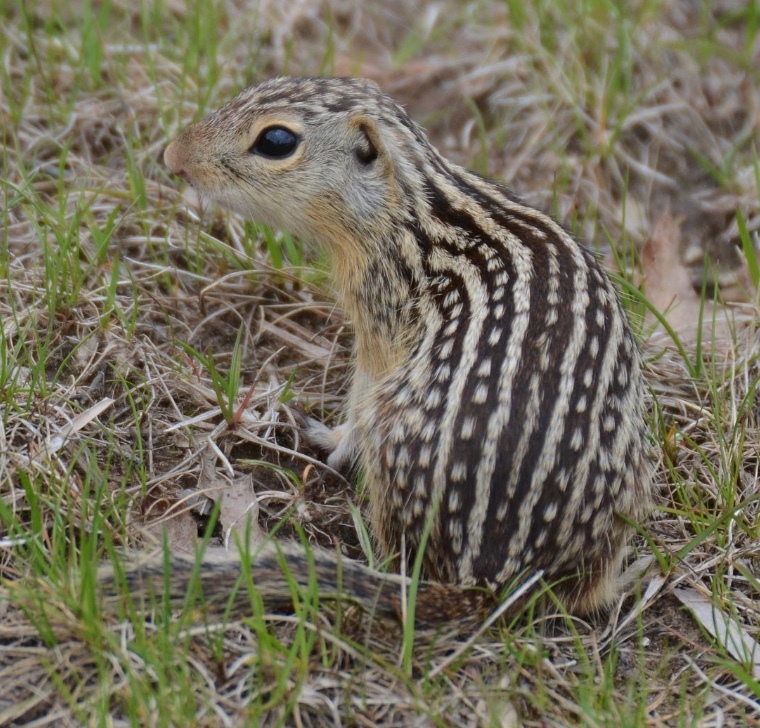 If other control methods have failed, thirteen-lined ground squirrels can be trapped and removed. A permit is not needed. Live-traps baited with seed can be used to capture the animals. If you plan to release the squirrel, it is recommended to release the squirrel five to 10 miles away. You will need permission of the landowner before you release the squirrel. Rat-sized snap traps are efficient if ground squirrels are to be lethally removed. Nuisance wildlife control operators will trap and remove thirteen-lined ground squirrels for a fee. Franklin’s ground squirrels may not be removed without a special permit. In Illinois, thirteen-lined ground squirrels are not protected by the Wildlife Code. They may be removed without a permit.